He was very thorough with explanations of what was going on and the mold testing process. He educated me on the test and air quality. He taught me things I didn't know about mold. They're on time, they know what they're doing, and they have a fair price. They are always available when I need them. They handled my emergency pretty fast. It was fast, and they gave me a lot of good information when they came. 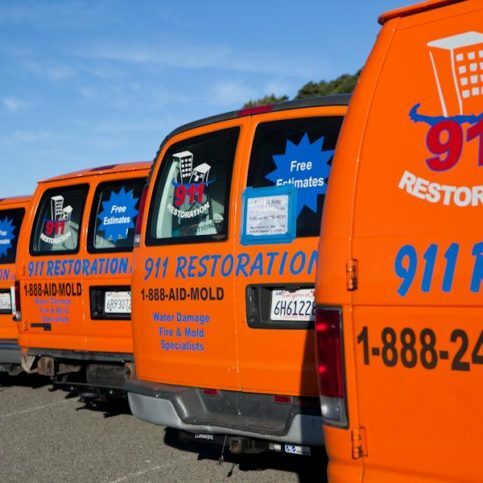 9 11 Remediation LLC provides a complete range of water and fire damage restoration services for residential and commercial clients throughout the Greater Bay Area. 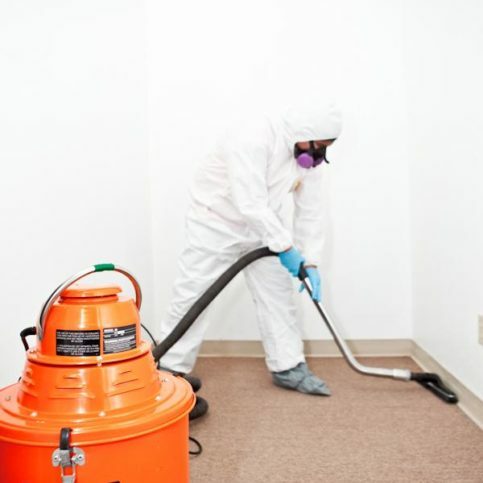 The company is available 24/7 to handle emergency situations, and it also has the training and equipment to clean air ducts, perform mold inspection and removal, inspect crawlspaces, and more. 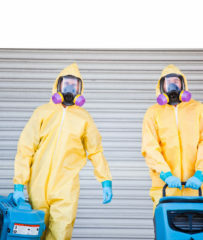 Two 911 Remediation technicians carry state-of-the-art equipment to a restoration job. 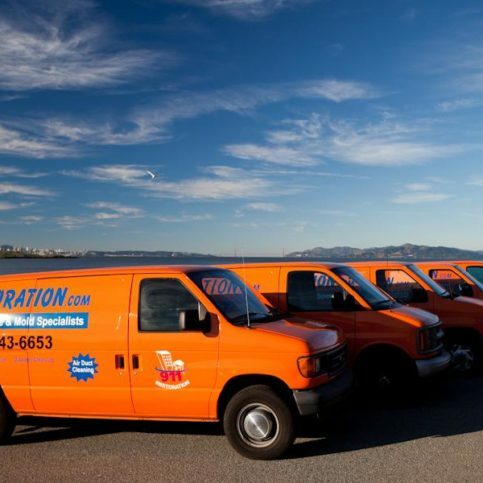 911 Remediation has been providing water and fire damage restoration services for residential and commercial clients throughout the Greater Bay Area since 2007. 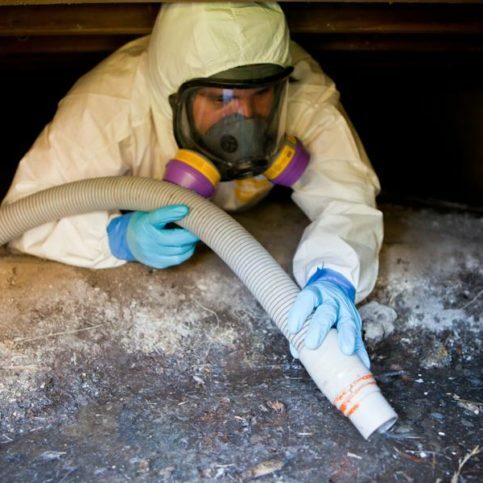 The company is available 24/7 to handle emergencies, and it also has the training and equipment to clean air ducts, inspect crawlspaces, and perform mold testing and removal. 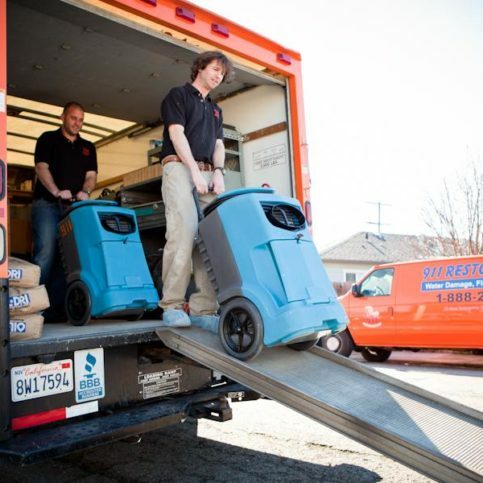 Leave the big cleanup to the professionals. Don’t attempt to wash walls, shampoo carpet or clean upholstery without approval from your restoration contractor—using improper methods can exacerbate the damage and permanently set stains. You should also get permission to clean heavy items and potentially hazardous areas. Have electrical appliances and lights professionally inspected. Appliances that have been exposed to fire and water can be electrical hazards. Ceiling fans and lights should be inspected by an electrician to rule out wiring damage or electrical problems that could potentially reignite and cause another disaster. Don’t track dirt and soot around your home. Limit moving around in fire-damaged areas of your home until they’re cleaned by a professional. If you must enter rooms that have been damaged by fire and smoke, put down towels, rugs or protective coverings before walking on the floor to avoid tracking dirt into other areas of your home. Cover heating and air conditioning registers. Air movement can stir soot and ash within your home, so shut air vents and mask them with plastic in areas where you don’t need air circulation. In rooms that require heating or cooling, secure layered sections of cheesecloth over the air ducts to allow air flow. Protect chrome surfaces. Chrome and stainless steel surfaces such as appliances, kitchen and bathroom fixtures, and sinks can become stained or damaged by soot. To prevent this, clean and protect them by lightly coating them with baby oil or petroleum jelly. Care for your clothing. Regular dry cleaners can actually set in smoke odors, so talk to a cleaning professional about the best ways to clean your clothing. Q: How can I learn more about your services? A: You can visit our website, www.911remediation.com, for general information about our remediation work. You can also call us and talk to one of our customer service staff members—they’re carefully trained and have a lot of industry knowledge, so they can answer almost any question you have. If your question is complicated, one of our project managers can talk to you about your specific needs. Q: Do you work on jobs of all sizes? A: Yes, we do everything from small, $100 jobs to large projects that can cost up to $250,000. We’re ready for anything, and we adhere to the same high standards of quality on every job, regardless of its size. 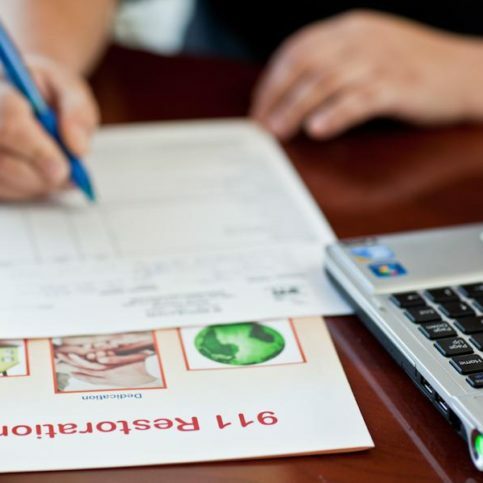 Q: How do I proceed if I have water damage and need my insurance to cover the remediation services? A: The first thing you should do is contact us, and your second call should be to your insurance company to file a claim. This is the only time you’ll be in contact with your insurance company. After that, we’ll take over all communications so you have one less thing to worry about after experiencing a loss. Q: Is it important to deal with water damage right away? A: Water leaks, flooding and other water damage situations are usually pretty urgent—if you wait too long, a secondary damage will occur: mold growth. That’s why it’s important to reach out to a remediation company as soon as water damage occurs so dry-out and cleanup can begin immediately. If we’re dealing with sewage water, we’ll also sanitize the affected area. Our customer service staff can help you decide the best course of action to take. Q: Can I remove mold myself? A: No. Mold is hazardous and can cause severe respiratory problems. It’s very important that you call a certified mold remediation company if you suspect your home or business has materials that contain mold. 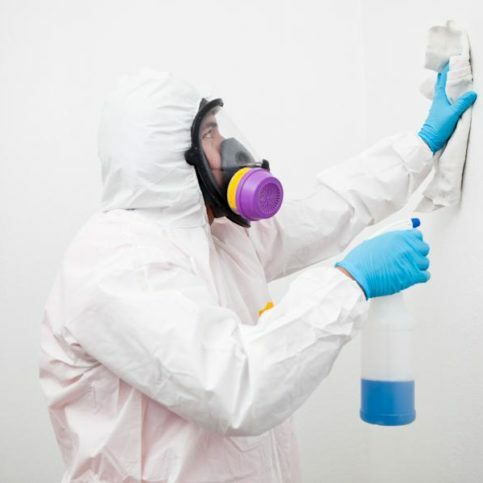 Any attempt to remove mold or disturb mold-containing materials can be hazardous to your health and the health of others who come into contact with the materials or the dust particles they leave behind. 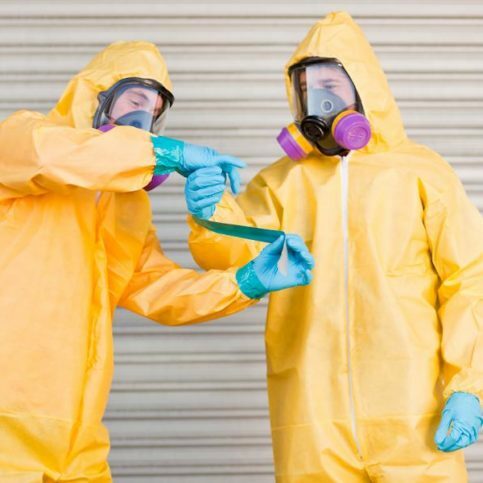 911 Remediation’s staff wears protective clothing as required for each project. Two 911 Remediation technicians unload commercial grade dehumidifiers, which are designed to remove moisture as quickly as possible. 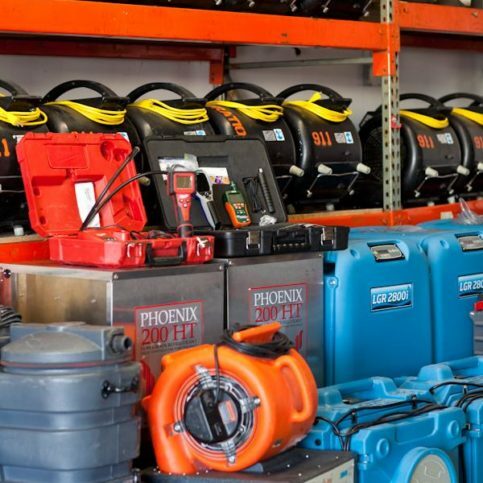 911 Remediation maintains a fully equipped warehouse with restoration equipment for all types of jobs. All of 911 Remediation’s equipment is clearly marked. 911 Remediation keeps all its customers’ records on file for future reference. 911 Remediation’s staff wears protective coverings whenever necessary. 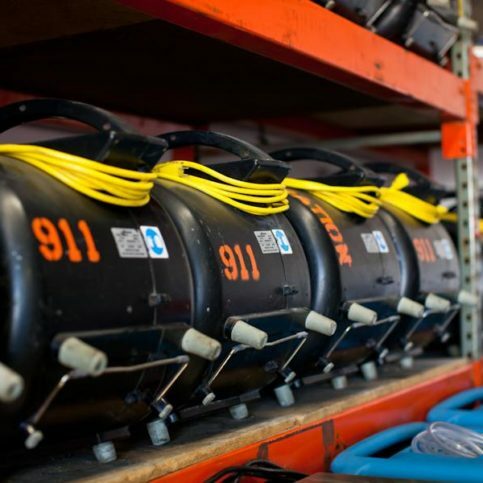 911 Remediation’s trucks are fully stocked with state-of-the-art equipment. 911 Remediation’s staff dresses professionally for each job. 911 Remediation’s vehicle fleet includes 10 trucks. 911 Remediation’s technicians wear protective gear. 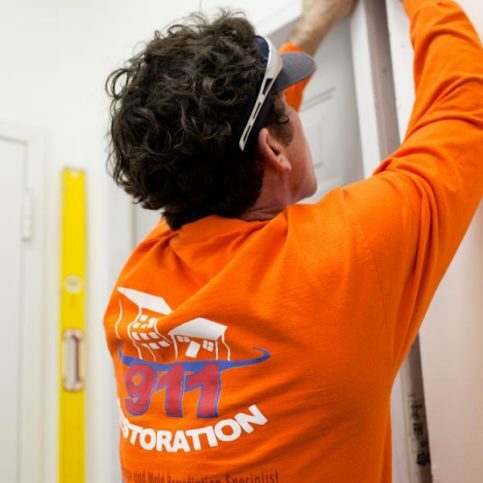 911 Remediation’s technicians are fully trained in flood and fire damage restoration. 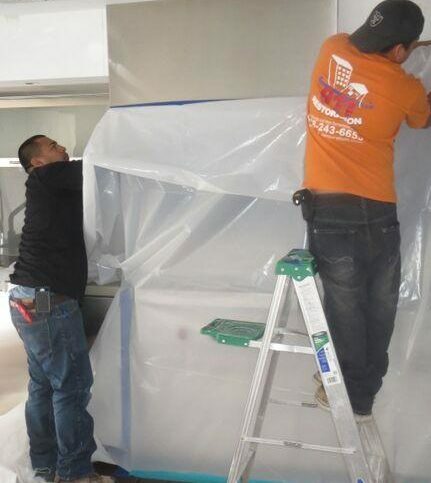 Two 911 Remediation technicians build a containment barrier to protect contents and avoid cross-contamination. Erez Gilad is a 12-year veteran of the restoration industry and owner of 911 Remediation LLC, a Diamond Certified company. He can be reached at (510) 221-6767 or by email. A: Coffee in the morning and tea in the evening. A: Betelnut in San Francisco. A: Answer our customers’ calls, of course! Shut off your home’s water main, which is typically located at the sidewalk in front of your home. In the event of a broken pipe, shutting off this valve will stop the water from entering your home. Try to identify the source of the leak—it’ll help the professionals solve the problem more quickly upon their arrival. Open your windows and doors to provide maximum ventilation. Mop as much standing water as you can. You can also use towels to dry wet areas. Remember, when water damage occurs, hiring a professional to dry out the structure is the key to avoiding problems after the fact, particularly mold. By getting professional assistance and taking independent measures, you can minimize the effects of water damage on both your home and life. RICHMOND — Host, Sarah Rutan: When water damage occurs in your home, you’ll need to act promptly to avoid potential secondary effects. Today we’re in Richmond with Diamond Certified Expert Contributor Erez Gilad of 911 Remediation to learn more. Diamond Certified Expert Contributor, Erez Gilad: If you suffer water damage it is important to deal with it immediately to avoid secondary damage such as mold growth. There are some steps you can take before professional arrive. Shut off the main water. Identify the source of the leak. Open your windows and doors; ventilation is very important. Mop the standing water as much as you can. Use towel to sop the water. Please note that using a professional to dry out the structure is the key to avoid secondary damage of mold growth on the structure and spreading mold spores in the air. RICHMOND — Host, Sarah Rutan: When it comes to removing a mold infestation, the professionals take a thorough approach. To get a firsthand view of the process, we’re in Richmond with Terry Barlcai of 911 Remediation, speaking on behalf of Diamond Certified Expert Contributor Erez Gilad. Terry Barlcai: We’re here today to talk about how to do mold remediation safely. Inside, we’re going to see how the structure is contained. The areas that we’re working on are completely sealed; negative areas running; and the guys inside cleaning up [00:00:18 unintelligible] to ensure that no bacteria or spores are still settled in. As you can see, all the guys are wearing PPE to make sure they are safe and your house is safe. HEPA vacuum – [00:00:32 did all the HEPA vacuum] that’s been done through all the wood members of the structure, to ensure the removal of all bacteria and spores. And here, you will see now the guys put in all the affected materials in plastic bags to ensure there will be no cross-contamination once we get it out of the site. So, as you can see, some of the mold is just a surface mold that we can basically wipe down with antimicrobial. No chemicals are in use here. And that’s the importance of doing mold remediation safely. Roee Erenshteyn is CEO of 911 Remediation LLC, a Diamond Certified company. He can be reached at (510) 275-3708 or by email. Outside of work, Roee engages in a variety of pastimes, from staying fit to spending quality time with his family. “I work a lot, so I try to spend as much time as possible with my wife and daughters,” he affirms. “We enjoy going on field trips in nature, eating out at restaurants and just relaxing at home. I also enjoy working out and training. I used to be a personal trainer, so I love long-distance running, cycling and mountain biking. A: I consider myself an early bird, but I also stay up late sometimes, so maybe I’m a bit of both. A: Pacific Catch in Corte Madera. A: Summer. I like going to the beach and hiking. A: Fruit. I’m a pretty healthy eater. RICHMOND — Water damage can strike in many forms, so it’s good to be prepared for all scenarios. Consider the following tips for identifying smaller instances and responding to major ones. Try to locate the source of the water and shut off the water supply to your home. Take photos of the damage—these will be useful later if you need to file a homeowners insurance claim. Use a mop or towels to extract as much water as possible. Open windows to bring air into your home. If you have large fans, focus them on the affected area. 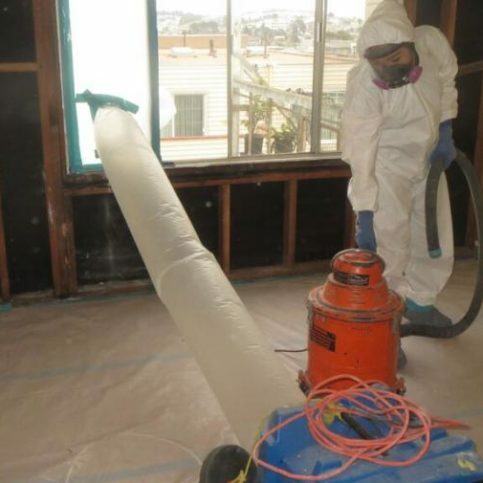 Contact a remediation company right away to come assess the damage. When dealing with a major instance of water damage, remember that time is of the essence. Often, homeowners will put off dealing with water damage for a couple of days, but those initial days are crucial. In that timeframe, the floor can sustain irreparable damage (such as buckling) and mold can develop within 48 hours. RICHMOND — Host, Sarah Rutan: In the event of a major water leak in your home, knowing how to respond can go a long way toward minimizing water damage. Today we’re in Richmond with Diamond Certified Expert Contributor Roee Erenshteyn of 911 Remediation LLC to learn more. Diamond Certified Expert Contributor, Roee Erenshteyn: Today we have a tip about water damage in your house, like a leak, or if a pipe bursts, and what you need to do. First of all, try to find the source and then shut off the water supply. Then try to extract as much water as you can using a mop, dry towel, or any piece of dry cloth. If you have fans, you can open the windows. After everything is done, you should always contact your local restoration company to come and inspect if there is moisture underneath the floor, in order to prevent secondary damage like mold. Following those steps, you will surely mitigate the problem the best way possible and save a lot of time and money. Thank you. RICHMOND — Host, Sarah Rutan: To keep your home mold-free, it’s important to learn about causal factors, as well as how to respond when mold is discovered. Today we’re in Richmond with Diamond Certified Expert Contributor Roee Erenshteyn of 911 Remediation LLC to learn more. Diamond Certified Expert Contributor, Roee Erenshteyn: Today we’re going to talk about mold and how to prevent it. First of all, mold grows when high humidity or moisture touches organic materials, with the combination of dust or dirt as its source of food. In order to prevent mold growth, it’s very important to keep your house highly ventilated and air flow, in order to reduce the level of the humidity. Open doors after you use the shower, and windows. Wipe down any water spillage as soon as possible. Keep your house clean. It means cleaning underneath furniture, behind furniture. Wipe down windows in order to reduce the amount of dust or dirt. It’s very important, if you do find mold, do not try to clean it. Call your local restoration company in order to come and inspect and asses the size of the damage and how to clean the mold. 911 Remediation LLC : Average 8.6 out of 10 based on 135 unique customer surveys of customer satisfaction. The insurance hired them, and they came out promptly. They are a quality company. I would say that they are prompt, and they complete the job well. They were very clean during the entire process. I thought they worked well with me and my tenants. Terry was knowledgeable, patient, and took the time to listen to me. He was amazingly present and helped me as a landlord. The thing that made me so satisfied was his knowledge of spores, mold, and his calm presence, his ability to talk to me and explain the process calmly. They are a first-class outfit. It was a very pleasant experience. They were honest and had fair pricing. They were also on time, clean, and friendly. They stuck to the bid and showed up on time. Use them if you have any water damage. If they have an issue with mold, contact them. I felt like he knew what he was talking about, and he knew where to find mold if there was any. It was a pretty dirty job, so they covered everything with plastic. They even wore booties over their shoes. They were conscientious and informative. It was a stressful and traumatic situation, and they were very thoughtful and empathetic. They were timely, and I had no problems. They do the job they say they're going to do. They are professional, knowledgeable, and friendly. They were very competitive in price, and they got the job done on time. I just thought that they had great pricing. They're efficient, knowledgeable, informative, and professional. I think they're a prompt service. They had a very quick response time, they took the job seriously, and they got it completed quickly. The swift response time, I've used them before for an emergency flood, and they arrived within 2 hours.